These are the words from a mother who has experienced the profound impact of pregnancy and infant loss. I will be sharing more stories in honour of Pregnancy & Infant Loss Awareness Month. My story begins in the early morning hours of November 27, 2015. I stumbled sleepily to the bathroom, full of hope and anticipation – I was going to take a pregnancy test. I was excited, yet cautiously optimistic, we had only been trying for one cycle, so I didn’t want to get my hopes up if it was negative. However, I didn’t have to wait very long for those two bright pink lines to appear. I was indeed pregnant with our second child! I was over the moon excited, as was my husband. This child would complete our family, we already had one precious, perfect, beautiful son, and this new baby would be a wonderful addition to our happy little family. The first half of the pregnancy was perfect and wonderful, aside from being more nauseous this time around, our appointments and scans showed a perfect, healthy baby. Until our 20 week anatomy scan. Something was very wrong. 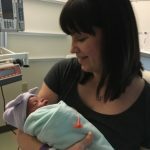 In the same day we found out we were expecting a baby girl, our excitement was crushed with the weight of discovering our baby was not healthy. We were referred to a specialist’s clinic where they did extra ultrasounds and testing. After weeks of uncertainty, of being on an emotional roller coaster, my world came to a halt. On May 4th, 2016 at 3:45am Violet was delivered stillborn. I got to hold her and kiss her, spend time with her, and all I could do was cry. I cried like I’ve never cried before. I felt my heart shattering into a million pieces. All I could do was hold her and look at her and tell her how sorry I was. I couldn’t protect her, the one job I was supposed to do as a mother, protect and keep her healthy and safe, and I had failed. I had a volcano of emotions and feelings and I didn’t know how to process and handle any of them. The next few days and weeks were filled with many tears and emotions, love, hate, grief, guilt, shame, hopelessness, isolation, but were also filled with the love and support of friends and family. I could not have gotten through without the love of my husband and our son, our friends, my best friend and my own mother who both flew across the country to be with us and help us out. I also sought the help of a counsellor, speaking to a professional about everything swirling around in my head and my heart really helped me navigate the first few months and how to handle transitioning back to “normal life”. Although our normal life as we knew it, was gone forever. 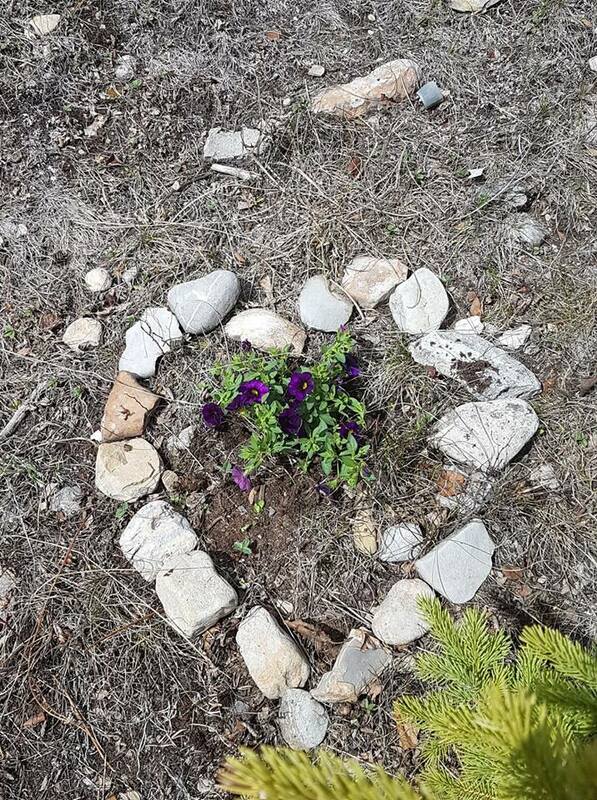 We chose to spread her ashes at a scenic spot in the mountains, and we planted some flowers for her, so we can go back to this spot whenever we’re thinking of her, when I miss her, when I want to feel close to her. Although I do know deep down I don’t need to be at this specific spot to be close to her, I know she is wherever I am. I can close my eyes, take a few deep breaths and think of her, say a silent wish or prayer or speak to her, and I know she’s with me. What I have learned the most from the past two years, is that I am stronger than I ever thought possible. There is more love in this world, there’s more love between my husband and our son, and our bond is unbreakable. I have had to reach deeply within myself to gather strength, courage, peace, acceptance, and faith. I had to reach deep within my soul to parts I never thought existed. I have grown into a more compassionate, gentle, gracious person than I ever could have dreamed for myself. I have goals, ideas, ambitions, and dreams, on how to reach out, tell my story, and let other families know that they are not alone. They do not have to face these heart shattering experiences by themselves. Although all of these lessons have come with a price; the price of losing our daughter. I am proud of the person I have become over the last two years, and I look forward to the person I will become in the years ahead. I truly believe in the depths of my soul I can make a difference. I was meant for more. However, this by no means makes me happy for what we went through. I’m not happy we lost our daughter. But I am thankful for her, and the lessons I am learning. I am thankful for how I am growing, and changing, and for the positive changes ahead. I am thankful I have come out the other side, out of the darkness, and I have absolute faith this is where I’m supposed to be and I have faith that I can see the light on the other end. I am thankful for my strength, I am thankful for Violet for guiding me and being with me, I am blessed to have held her for the brief hours that I did, and I’m thankful that I am moving forward with love and light in my heart, and with the determination to make her proud. I want to honour her, I want to be sure she’s proud of me and cheering me on in Heaven. Until we meet again, my precious angel. Jackie will be writing a book about the loss of Violet alongside many other stories of loss. I will share details as they become available.